A huge, awkward-looking machine named Beetle is going to provide clean water for tens of thousands of Central Africans for decades to come. 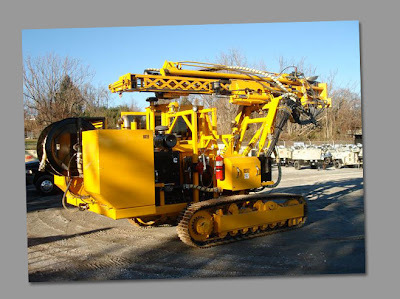 Built by the Gill Rock Drill Co. in Lebanon, PA, the Beetle is a very specialized piece of equipment especially designed to drill water wells in the most rugged of circumstances. Later this month the staff of Integrated Community Development International (ICDI) will be loading the new Beetle, along with several thousand dollars of supporting equipment and supplies, onto a cargo ship destined for Africa. Hocking explained that Repasky is the president of Hanover Architectural Products in Hanover, PA. For several months John and his crew at Hanover have been in the process of building a custom-designed well-drilling rig for ICDI’s work in the Central African Republic, originally scheduled for delivery in time for the 2009 well drilling season. Engineering delays, however, have slowed the construction process. Repasky, unsettled that people were in desperate need of clean water, found a barely used Gill Beetle for sale at the Volvo Construction Equipment Co. in Lewisberry, PA.
Several phone calls later John was face-to-face with the sales staff at Volvo sharing about how God was going to use this piece of equipment to save many lives. Everyone was thrilled and they have pitched in to make this a reality. Currently ICDI’s garage manager, Doug Murtoff, is training to operate the Beetle and he is preparing to head to Africa for six months.